I think my mistake with this book was reading it right after I was already feeling a little “meh” about The 5th Wave. 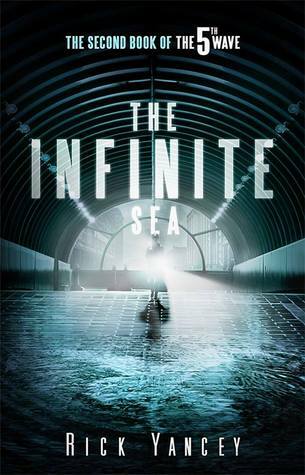 The first book started out great and then just seemed to drag on and reading The Infinite Sea right after felt like I was dragging the story out even more. The Infinite Sea is a much more manageable 300 pages (compared to The 5th Wave’s 500+) but I felt like it suffered a bit from Second Book Syndrome (It’s a thing – trust me). We get to explore some of the side characters’ stories in this book which is great for character development but not so good for story movement. This book, like a lot of second books in trilogies, spent its time setting up for the final installment: The Last Star. I still really like the overall idea of the story and I’m still rooting for the main characters, but I think that the wait until May for the last book will be a welcome one. Having the release of the movie in January will (hopefully) be enough to get me excited to enter this world again. For now, I’m good with moving on. I felt the same. I loved the first book, but then with the second I was just “meh”. To be honest I can hardly even remember what happened in the 2nd. I’m hoping the 3rd book will be more like the 1st. Totally. Another case of second book syndrome.